In the past decade, thermostats have made amazing leaps in the technology department, making home heating and cooling systems more efficient and easy to manage. 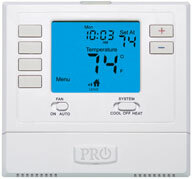 We carry several types of thermostats ranging from a standard no-frills heat/cool thermostat, to a WiFi-connected smart thermostat that can tell when you leave home and come back. To determine what thermostat best suits your needs, our staff experts will assess your home and existing equipment to establish the optimum control. Call us today for more information about the thermostat options for your home, or use our online appointment scheduler for a free in-home estimate. 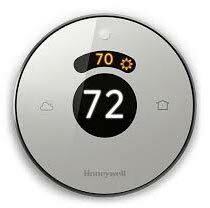 The Lyric thermostat by Honeywell is a new tool in home heating and cooling efficiency. Featuring a geofencing tool that automatically regulates temperature while you are away, fine tuning for optimum humidity based on temperature and mobile device control capabilities, the Lyric thermostat could be your key to unlocking a reduced energy bill! Call to speak with a design specialist today to see if the Lyric is right for you. The Connex control is one of our signature offerings. Paired with a high-efficiency signature furnace, you will achieve a level of control over your system that will be reflected in your energy savings. This thermostat is capable of managing a complete home HVAC system including humidity, ventilation and zoning; it is also the brains behind our highest-efficiency Evolution products. 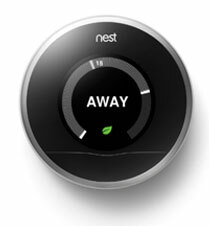 The Nest is one of the most widely known smart thermostats on the market. When you install a Nest in your home, it learns from your behaviors, preferences and surroundings to create a custom heating and cooling schedule, keeping you comfortable when you’re home and conserving energy when you’re away. 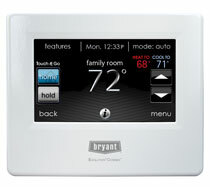 You can access your thermostat on the go from a mobile device or from another room in your home from a laptop. Ask a design specialist if a nest is right for you! The T-855 is a two-stage programmable thermostat perfect for homeowners who want programmable capabilities without Wi-Fi connectivity. The T-855 is an ideal thermostat for most energy-efficient two-stage furnace models. 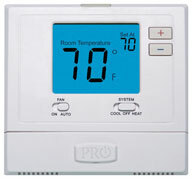 The T-705 is a single-stage thermostat with a programmable option. Ideal for any single-stage piece of equipment, this thermostat will allow you to save on energy cost by entering your home and away schedule. The T-701 is our most basic thermostat offering, a simple thermostat perfect for single-stage equipment that you don’t want to program to your schedule. With the 701 there is no fuss or confusion, pick a temperature and stay there. With a zoned system, your home is heated and cooled based on areas of usage. You have the ability to keep high-traffic rooms at your ideal temperature while adjusting the temperature in other rooms to save on energy. With zoned temperature control, each zone you create in your home has its own thermostat and each thermostat can be set at a different temperature. 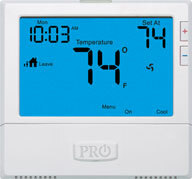 All thermostats are connected to an overall control panel that operates your heating and air conditioning system. The result is total control over your home’s environment. So, what can you expect from a zone system? Apex Heating and Air Conditioning specializes in heating and cooling repair of all brands (including but not limited to: Bryant, Coleman, Carrier, Goodman, Trane, Lennox, Rheem, American Standard, York, Tempstar, Arcoaire, Heil, Whirlpool and Amana), installation, estimates, and maintenance. Apex HVAC experts offer 24-hour emergency service, extended business hours, same-day repairs, flat-rate pricing, and a 100% satisfaction guarantee. Apex offers quality work at competitive prices, free estimates on new systems, and is a Nest Certified Dealer.